After a lovely stay at Roche Harbor, we headed east along Spieden Channel, noting the adorable cabins and lovely grounds of Lonesome Cove Resort, located along the north shore of San Juan Island in Lonesome Cove. 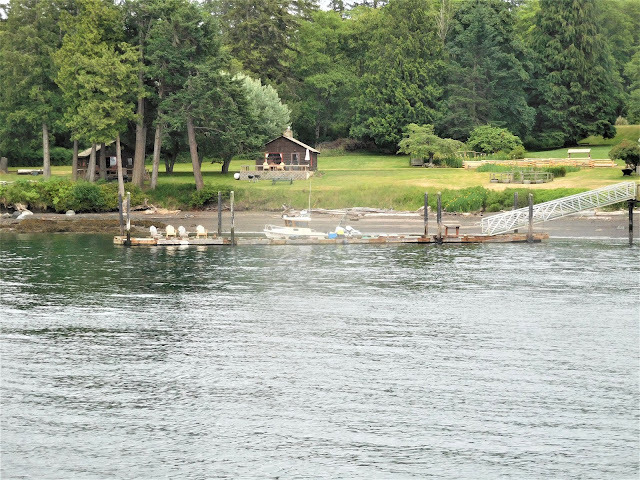 Boaters can tie-up to the resort’s dock if staying in one of the cabins. The resort is a charming step back in time with an emphasis on relaxation and leaving the distractions of a busy world behind. Caution, the dock may be lively due to boat wakes and wind out of the north. Heading across San Juan Channel, we wound our way through the Wasp Islands and into Harney Channel. 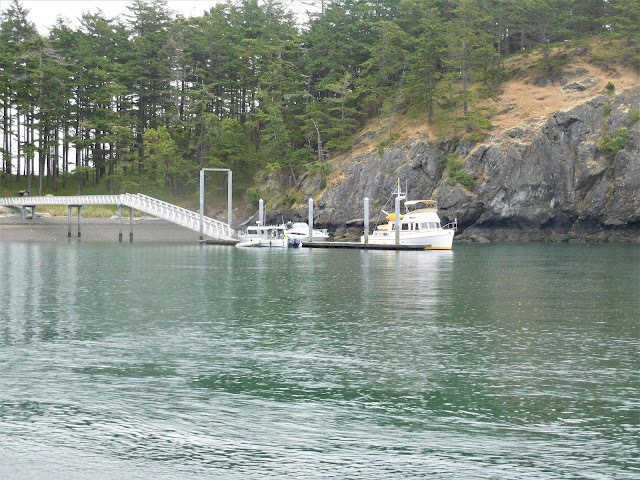 Boat traffic continued to pick up as we neared Shaw Island; it was a busy weekend with numerous pleasure boats coming and going from every direction; it seemed that everyone was in a hurry to get somewhere. When it gets crowded, we stay off to one side allowing room for faster boats to pass us. 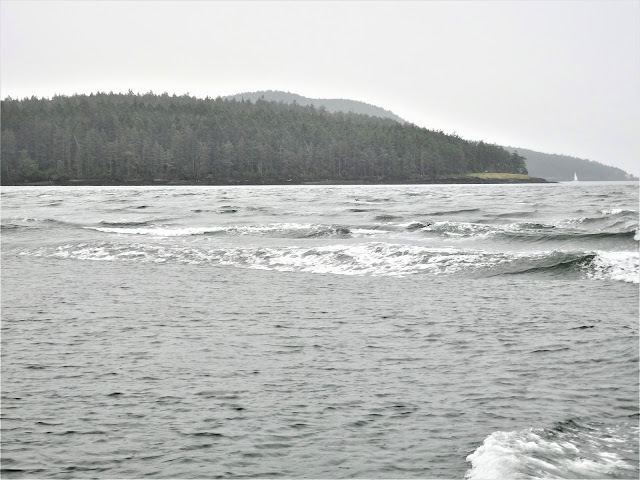 As we approached the north end of Lopez Island near Humphrey Head, a boat passed us on our port side, and another boat coming from the opposite direction was ready to also pass along our port side; the shoals of Humphrey Head were to our starboard (right side). In the distance we saw a high-speed tour boat headed our way. Avoiding the boats to our port side, the tour boat kept heading directly at us going 24 knots; perhaps he doesn’t see us, we thought. We couldn’t turn to port because of other traffic, and we couldn’t turn to starboard into Humphrey Head, and we didn’t want to stop dead in the water and lose our maneuverability if he hadn’t seen us. What to do? Seeing that a traffic conflict was imminent, we gave the warning signal of five blasts on the horn as the tour boat crossed in front of our bow and squeezed along the shoreline, he then cut back behind our stern and away from shore again. Rather than getting upset, we practiced what has been suggested in the 2018 Waggoner Cruising Guide. We gave a securite’ call on “low power” over the radio to alert other boaters; “securite’ securite’ securite’, caution for a high-speed tour boat operating in an unsafe manner near Humphrey Head.” The captain of the tour boat contacted us and apologized for the close encounter. 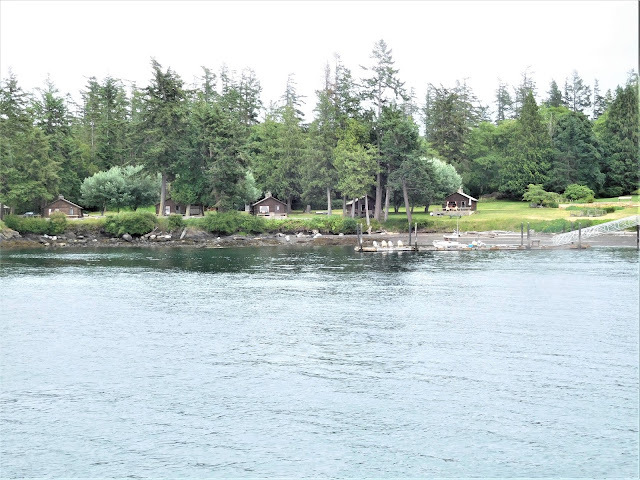 It seemed rather ironic, that we had gone out to sea along the west coast of Vancouver Island, which is thought to be challenging; and instead, it was in a congested area on a busy weekend that put us at risk. Note the photo of our screen which was taken after the tour boat passed us: our boat is shown in green and our track line shown in red; boat traffic (blue boats) in front of us and behind us; the tour boat’s track line is in blue shown crossing our path at Humphrey Head. The tour boat is seen heading southwest after rounding Humphry Head and Upright Head. Before we motored home across Rosario Strait, we stopped at James Island to see the new dock and new extended walkway and ramp; the facility is much improved, but boaters still need to be aware of current when docking. Overcast skies and light rain had started to move in. As we headed into Guemes Channel, we were running against an ebb tide; there were standing waves at the transition point between Rosario Strait and Guemes Channel; we took it all in stride and safely arrived at our home port of Anacortes. Stay tuned for our next boating adventures beginning in mid-June.